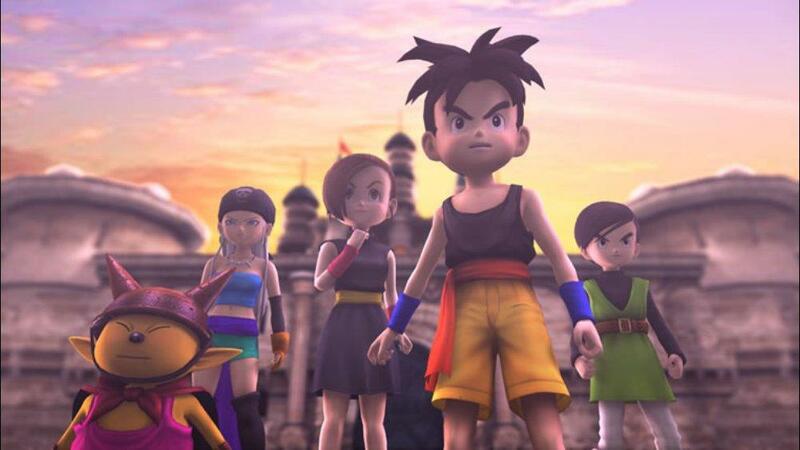 Blue Dragon is one of those games that I thought I would either love or hate, that there would be no middle ground. It turns out I could not have been more wrong! 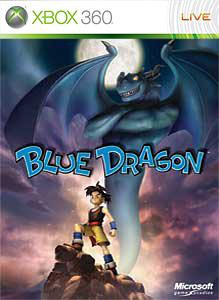 It seemed nothing would be simple about my experience with Blue Dragon. Even as I sit here writing this, I am torn about a few things. Let’s break it down and see where things land. 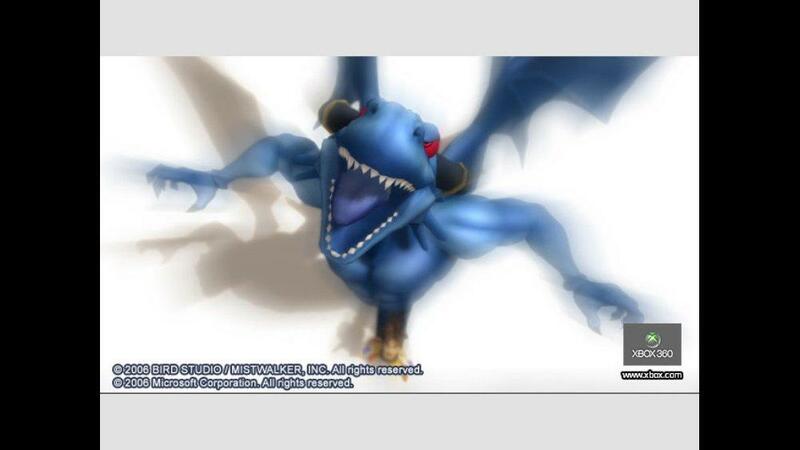 Blue Dragon takes place in a world where evil is lurking. Shu, Kluke and Jiro have seen this evil in their own little town. A Land Shark, which is exactly what it sounds like- a shark found on land- devastates their town. After each relentless attack from the Land Shark, they make the town habitable, and then it shows up again to devastate the town and the people. They get tired of dealing with the Land Shark, and set out to destroy this evil menace that is tearing their town apart. The group finds a lot more than they bargained for in doing so, including new friends who join the group. I joined the gang as they took on their adventure, and we discovered the secrets of the world. Together, we righted wrongs and changed the lives of the people living in this world. While we were out righting these wrongs, and figuring out what the hell was going on, we had to do a lot of fighting. The battle system is something that can either make or break a game in my opinion. Make fighting a chore, and I will almost always skip the game entirely! 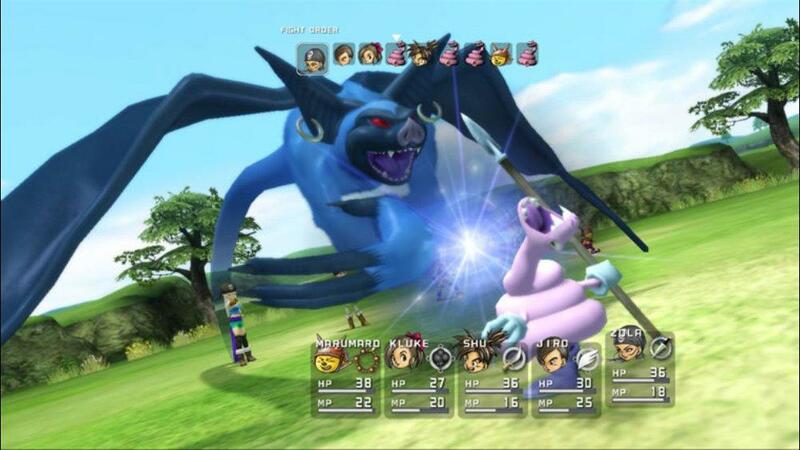 Luckily, with Blue Dragon, the battle system was easy to use, yet provided enough management and fun that kept me interested. Each character in the game will receive a “Shadow” very early on which allows them to use magic. These Shadows appear as blue shadows behind each party member in battles. Each one is different, with its own look that compliments the character to whom it is attached. The Shadows will get a Corporeal much later in the game. This is like an overdrive that causes a lot of damage, and looks really cool. During this, your Shadow becomes “real,” and takes on a very specific look of its own with color and depth. Since they were introduced so late in the game, I actually forgot about having them once or twice when I could have used them and saved myself from a horrible death, maybe. Your Shadow stays the same, but your class, which allows you to use different types of magic and skills, can be changed. Each new class that you unlock will have a different set of skills that you learn by leveling the class up. As you level each class up, you also increase the stats of your character. If you change your class to a White Mage, for example, you will unlock the ability to use healing type spells. Spells can be found throughout the game or bought at a Spell Shop. You can change your class throughout the game as long as the class you want to use is unlocked, which happens through leveling your character up. You need to do this in order to give each party member the best skills to help you get through the game. For example, the last skill learned as a White Mage is Resurrection. I made most of my party a White Mage long enough to learn that. As a Generalist, you learn a skill that allows you to equip more skills slots. This is important, since the more skills you have equipped, the better prepared you can be for battle. I had most of my party learn things like that so that I could handle some of the extra boss battles. Another thing you should always check is your combat formation. Your party members with the highest hit points and defense should be in the front row, while those with fewer hit points and defense should be in the back. Every class will give you one skill that you can automatically access without having to equip it. A White Mage will be able to use White Magic without having to use a skill slot to equip it. While you are leveling up other classes, or if you want your party to be able to multitask, you can equip other skills from different classes. Say you would like your party member to be able to use the White Mage skills while they are the Monk class, you would equip the skill for White Magic, and have access to both sets of abilities from each class. Enemies are visible on the world map, and you can walk up to them or sneak up on them for a back attack. If you see more than one enemy grouped together you can encompass them into one battle by hitting the right trigger on the controller. You fight one group of enemies at a time, and, after the first battle, a bonus roulette shows up that gives you different helpful things. These vary from improved stealth to HP healing. Another cool thing that happens in battle is when two enemies who don’t like each other appear in the same battle, you trigger a Monster Battle. When that happens, the monsters will attack each other instead of you. Battles are turn-based, and allow you plenty of time to plan your strategy. Your party can be arranged in any fashion that you like. I had a White and Black Mage and a couple of “tanks” in my party. At the top of your screen, you will see the turn order. 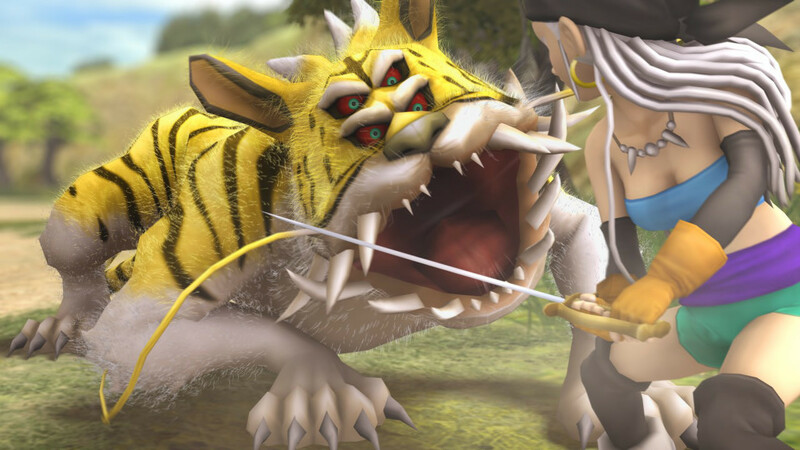 Some attacks and all of the magic spells use what is called a “charge.” The charged attacks and spells really help to lay out a strategy for boss battles, or when fighting a particularly stout enemy. Once you select the attack that you want to use, a bar will appear right under the pictures of the attack order. Hold down A to charge the attack. You can then choose to charge the attack to the red area shown on the bar, which gives you the best result, or you can charge it as little or as much as you want. Doing this allows you to control when the attack or healing spell will come out in the turn order. This comes in handy when you need to be healed quickly, because you can lightly charge the attack and get a healing spell out before the enemy’s next turn.